If you like Jiffy Corn Muffin, then chances are you’ll love these. They’re sweet, tasty, and easy to get on the table quickly, which is probably the best part. Y’all enjoy! Preheat oven to 400° F. Combine flour, cornmeal, sugar, baking powder, and salt in a medium size bowl. Add oil, egg, and milk. Stir until lumps are gone. Pour into a greased muffin pan and bake for 15 to 20 minutes, or until golden brown on top. I am sure the sweet cornbread muffins are great. 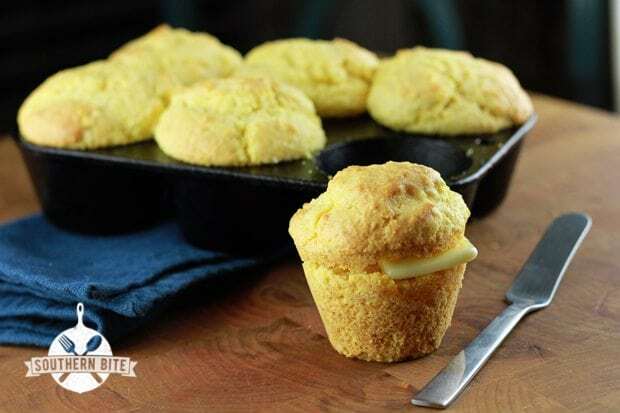 How about real Southern cornbread muffins without the sugar. I found there to be too much baking powder. Did they mean 1 teaspoon? Hi Elizabeth! How did you determine there was too much baking powder? Taste? Texture? What type of baking powder did you use? Good recipe! Really easy. I didn’t have vegetable oil, but I really wanted to try these. I only had coconut oil and butter, so I made 2 batches. One with coconut oil & one with butter. Both turned out tasty! That’s great to hear, Karina! So glad they turned out well for you! had a late-night craving & made these on a whim; followed the recipe exactly & baked with convection for 12 minutes to golden, just-sweet-enough perfection. craving satisfied! and leftovers will be great with homemade split pea soup for tomorrow’s lunch. thank you! I made these and they were so yummy!! I actually added frozen sweet corn Kernels (thawed first). After reading another’s post about the baking powder, I thought about it and it seemed a little much to me too. I’m not sure if the measurement was a mistake or not, but I used just a teaspoon and the muffins rose perfectlyand tasted great. So if anyone thinks a Tbsp is too much, then a tsp works fine. Thanks for the simple recipe! Hello. Found your post on Pinterest. As of tonight, I’ve made this two nights in a row with homemade chili and tonight, a soup (it’s in the 20’s to 30’s here). It is a fast recipe and tasted great. My young children loved it! I did adapt the recipe by replacing the oil with unsweetened applesauce as I do with most every recipe . I always add a tad of oil in the baking dish before adding the mixture to get crisp edges. Thank you for posting this. Wonderful! I’m so glad you’re enjoying the recipe!! 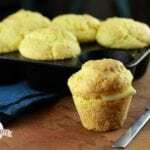 This is my go to cornbread muffin recipe now! Thank you! No longer do I buy Jiffy! I do add a little more milk than what your recipe calls for just because it seems a little dry to me…..I probably don’t need to but …. They have come out perfect each time and get gone quick!! Thanks again! Fantastic! So glad you’ve enjoyed them!! I make these all the time and get rave reviews, I follow the recipe exactly with no issues. Making them tonight to go with chili, yum!!! Thanks for this recipe Stacey! You are so welcome! Thanks, Kealey! I get confused over whether to use plain cornmeal or self rising. I’m thinking I would use just regular cornmeal for this recipe? Yes, I should know this?. Yes, plain cornmeal or use self rising and omit the baking powder and salt. I’ve made this a few times, adjusting as I went. I doubled the recipe, but not the baking powder (used a little less than a TBSP). Added an extra tablespoon of sugar and a cap of vanilla extract. Turned out the best so far. Made mini muffins 400 degrees for 14 mins. Sounds great! Thanks for sharing your tweaks!